Ash—Ash is material smaller than approximately a tenth of an inch (2 millimeters) that is emitted from an erupting volcano; it can also contain lapilli (also called cinders or “little stones”), which is between 1 and 25 inches (2 and 64 centimeters). In a large eruption, ash can accumulate to a great thickness and spread out for thousands of miles (usually in the direction of the prevailing winds). Block—Blocks are solid rock emitted from an erupting volcano. They can be anywhere from the size of a baseball to the size of a boulder as large as a house. Bombs—Bombs are volcanic rocks that are still molten inside; they are shaped by their passage through the air. (They form the brilliant arcs seen in time-lapse photography of volcanic eruptions.) Typically ranging from baseball to basketball size, they can be as large as a house. Bombs (and blocks) can be ejected from a volcano with initial velocities greater than 1,000 miles (1,609 kilometers) per hour, and can travel more than 3 miles (5 kilometers), with some exploding and gushing molten rock when they eventually strike the ground. There are also certain types of bombs, including spindle bombs (very fluid magma chunks that are streamlined as they fly through the air) and bread crust, which is formed from viscous magma, creating rounded blobs that often have fractured surfaces. 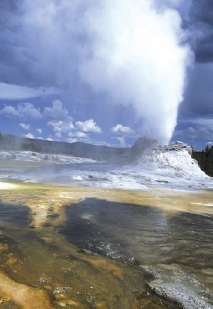 The scenic geysers and hot springs of Yellowstone are the result of volcanic activity just under the surface of the famous national park.